Yes, the Canadian economy is exposed to the risk of a severe US downturn, so it's reasonable to expect a depreciation against currencies that are better insulated, such as the euro or the yen. But that reasoning also means that the CAD should appreciate against the currencies of economies that are less insulated from a US recession. A good example of an economy that is more exposed than Canada is to a US recession is - wait for it - the US. Unless someone has a story in which a Canadian slowdown would be even more severe than what will hit the US - and I've yet to see anyone explain how it will - then this story from Reuters makes no sense at all. [T]here are clear signs that the U.S. economy is likely to experience a deeper and more prolonged slowdown than had been projected in January. This stems from further weakening in the residential housing market, which is adversely affecting other sectors of the U.S. economy and contributing to further tightening in credit conditions. The deterioration in economic and financial conditions in the United States can be expected to have significant spillover effects on the global economy. These developments suggest that important downside risks to Canada's economic outlook that were identified in the MPRU are materializing and, in some respects, intensifying. I was expecting and recommending a cut of 25 bps, but there was a decent case to be made for a reduction of 50 bps. Unfortunately, it was not the case that the Bank made. Core inflation is still way below its target. Credit conditions are tighter than what they were last summer. A 50 bps cut still means that effective borrowing rates are higher than they were when the Bank last had a tightening bias. Now that the current account has gone negative, the CAD is unlikely to appreciate much more in the near term. 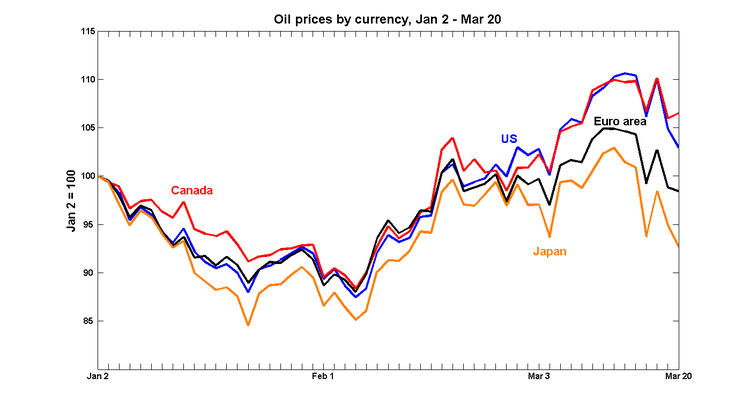 And if the CAD-USD rate stays stable while oil prices continue to rise, then exports will be somewhat cushioned from the US slowdown. Domestic demand has been taking up the slack from weak export growth for the last six years; it's hard to see why we should be panicking about the ability to shift output away from exports at this stage. So while I'm not overly concerned about the Bank's decision, I am somewhat worried about the reasoning it used to arrive at it. Especially if this reasoning is used to guide future interest rate decisions. Economic growth slowed considerably in the fourth quarter as real gross domestic product (GDP) grew 0.2%, down from 0.7% in the third quarter. Economic output contracted 0.7% in December. Exports recorded a significant 2.2% decline in the fourth quarter, in the wake of a rising Canadian dollar and extended holiday shutdowns in several motor vehicle manufacturing facilities. Meanwhile, strong growth in final domestic demand and an accumulation of wholesale and retail inventories drove imports up 2.6%. The drop in exports was the first decline in six quarters, as Canada's international trade balance continued to deteriorate in the fourth quarter. Consumer spending picked up in the fourth quarter of 2007, boosted by a 4.3% jump in motor vehicle purchases, higher travel spending abroad and increased purchases of air transportation. Business investment in machinery and equipment continued at a strong pace. The output of the service industries expanded 0.7% in the fourth quarter, while the goods-producing industries contracted 0.9%. Wholesale and retail trade, along with utilities, recorded the strongest growth. The finance and insurance sector, construction, forestry, and accommodation and food services also contributed to the overall increase. These gains were partly offset by declines in manufacturing, mining and selected transportation industries. Corporate profits were up slightly (+0.5%), well short of the pace set in the previous three quarters. Labour income registered a strong fourth quarter. Employment and average earnings continued to grow in the quarter. The sharp drop in exports is worrisome, but if the CAD stops appreciating, then they may level off. We've already seen that December's bad weather has skewed data from that month. Domestic demand and the factors that are driving it - wages and profits - are still holding up. I've been unavoidably delayed in responding to a wave of recent events, so it's catch-up time. The 2007Q4 current account went negative for the first time this century. Although imports and investment income payments held steady, the CAD appreciation led to declines in both the value of exports and in the value of investment income receipts. So the six-year appreciation of the CAD may finally be drawing to an end.